My goal was to find some good mobile educational games. I’d love to find some educational experiences for my students that would put them into that gaming state of mind, where time and boredom cease to exist and play takes over. So far I have not found anything that both educates my content and is fun. So I started with a search and found quite a few websites claiming to list the “Best Educational Games.” After looking at the sites, I question whether the writers of these sites actually teach or even spent any time with the apps they list. I have my own thoughts on what creates a good educational game. First, it’s gotta be fun, and second, it’s got to teach something that I want my students to learn. It would be great if the learning experience continued with different levels and prizes for continued learning as well, but even a short game that teaches something very specific, like the acceleration of a rocket or how gravity works would be very useful to me. This is my very simple list, but Shute & Ke (2012) have developed a more thorough list based on their research in game play. Interactive problem solving: Games require ongoing interaction between the player and the game, which usually involves the requirement to solve a series of problems or quests. Specific goals/rules: Games have rules to follow and goals to attain which help the player focus on what to do and when. Goals in games may be implicit or explicit. Adaptive challenges: Good games balance difficulty levels to match players’ abilities. The best games and instruction hover at the boundary of a student’s ability. Control: A good game should allow or encourage a player’s influence over gameplay, the game environment, and the learning experience. Ongoing feedback: Good games should provide timely information to players about their performance. Feedback can be explicit or implicit, and as research has indicated, has positive effects on learning. Uncertainty: evokes suspense and player engagement. If a game “telegraphs” its outcome, or can be seen as predictable, it will lose its appeal. Sensory stimuli: refer to the combination of graphics, sounds, and/or storyline used to excite the senses, which do not require “professional” graphics or sound to be compelling. 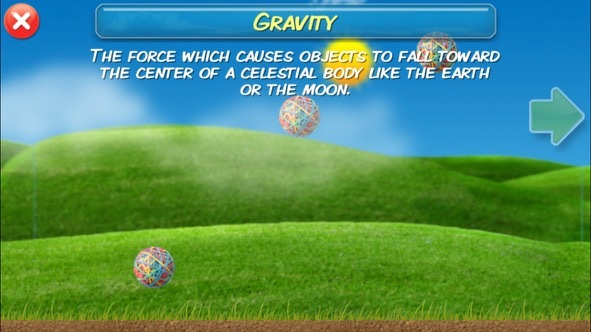 After looking through the websites claiming to list the best educational apps out there I settled on Monster Physics as something that looked interesting. I teach physics, so I’m always interested in good games that teach physics. Monster Physics has many of the Seven Core Elements of good games, you learn how to build little monsters using physical elements such as blocks, joints, motors, and even rockets. The game is fun and I was instantly in that gaming state where I felt like I needed to beat the levels. But all the time I was playing, I knew there was not much physics being learned. The experience is fun and compelling, but there was very little education happening and very little I could do with it to make it into a lesson. There were a couple screens where physics was mentioned in the “Learning” menu but this was it. What I need from any game or simulation, to make it valuable in a science class, is data. The students should be able to measure the time vs. position of a rocket they build or at least the program should plot a little graph of the acceleration of a car they build. If there is no data, then it’s not that valuable to a high school curriculum. I used to have simulation software called Interactive Physics that I loved because students could create things on the screen, just like with Monster Physics, but could also export the data, or set up little graphs that would plot the data they wanted to see. I could create an entire physics course based on Interactive Physics simulations. Next, I found elevate. I didn’t find it using the “Best Apps” sites above, I looked around myself and found this one. This is a “brain training” app. It has little games and tests that build skills scubas reading comprehension, mental sharpness, focus, and confidence. 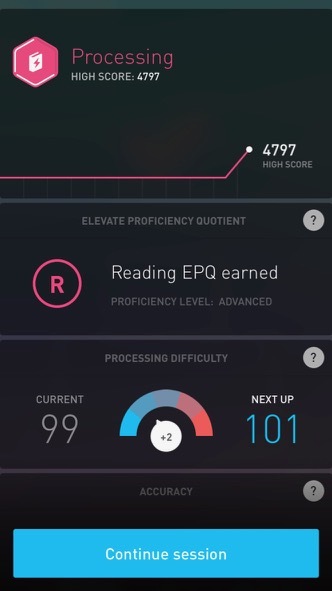 The app started with a short test to find my baseline levels and then created little exercises at my level in order to boost my skills in different areas. I like this app and I think I’ll use it for myself. I’m 51 years old and sometimes I think there are parts of my mental abilities that are declining. Definitely my math skills are nothing like they used to be. This app identifies those weaknesses and helps you work that muscle a bit when you might have let years go by without using it. This app most definitely has interactive problem solving, adaptive challenges, and ongoing feedback. You se your scores count up after each game and can watch the graphs of your abilities in different skills increase or decrease over time. I could see this as a great app for those kids that get done early with assignments or as an ongoing homework or extra credit assignment. I tried Yokee Guitar, which lead me to believe it would teach me how to play guitar. I can already play but I would love to find a good app that could teach me some new songs or skills. What a waste of time. It turns out this was just a Guitar Hero type app with dots to press as the notes come at you faster and faster. Clicking dots have nothing to do with playing and I always laughed at people tapping on buttons on a plastic guitar and thinking they were doing anything but air guitar. Air guitar is fun, no question, but tapping buttons is far removed from playing music. I’m still searching for good mobile apps for education. If you know of one please respond in the comments and I’ll check it out. Ke, F., & Shute, V.J. (2012). Games, learning, and assessment.